California’s “superbloom” appears in almost unbelievable color in a new aerial image from NASA. The spray of color is an annual event, made more intense by this year’s wet winter in California. 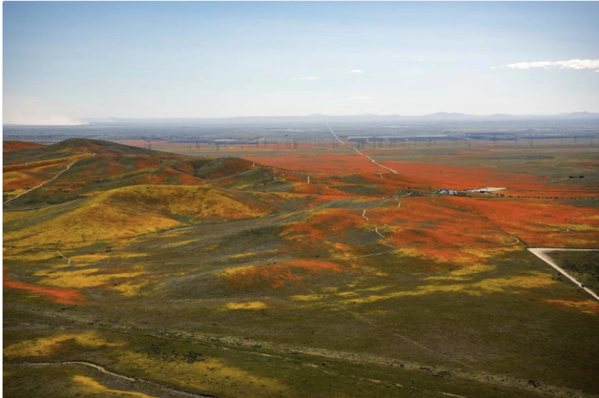 When the flowers are as dramatic as this year’s display, they’re called a “superbloom.” The last drought-busting season that resulted in a superbloom in California was in 2017. The week’s hottest temperature was 114 degrees Fahrenheit (45.6 degrees Celsius) in N’Guigmi, Niger. The week’s coldest temperature was minus 96.0 degrees Fahrenheit (minus 71.1 degrees Celsius) at Russia’s Vostok base, Antarctica. Scientists revealed the first-ever glimpse of a super-massive black hole on Wednesday, as the Event Horizon Telescope released the first results of its findings in a ‘groundbreaking’ discovery that opens up questions about conventional physics. The collaboration of scientists reveals what is called the “event horizon”, the boundary at the edge of a black hole where the gravitational pull is so strong that no conventional physical laws apply and nothing can escape. The image released on Wednesday shows the shadow of the hole at the centre of glowing plasma. The week’s hottest temperature was 112 degrees Fahrenheit (44.4 degrees Celsius) in Nawabshah, Pakistan. The week’s coldest temperature was minus 100.0 degrees Fahrenheit (minus 73.3 degrees Celsius) at Russia’s Vostok base, Antarctica. 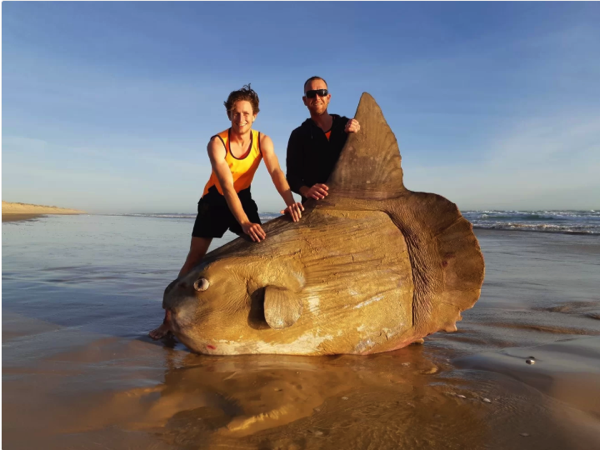 A group of Aussies spotted this behemoth on the beach and initially thought it was a rugged piece of driftwood. Upon closer inspection, however, they realized it was the body of an enormous, bony fish. It was later identified as an ocean sunfish, known to scientists as the Mola mola. 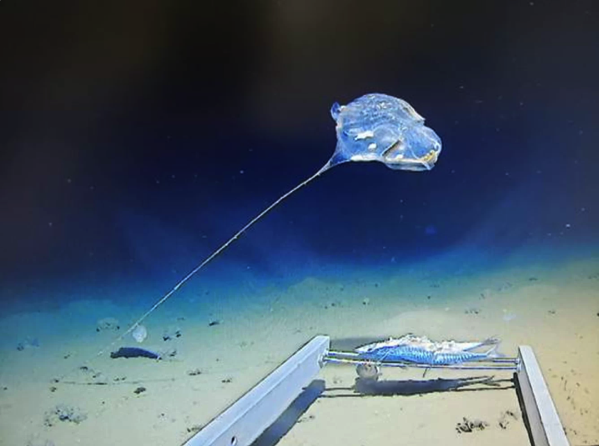 These fish can grow up to 11 feet (3.3 meters) long and weigh up to 2.5 tons (2.2 metric tons). At about noon local time on 18 December, the asteroid barrelled through the atmosphere at a speed of 32km/s, on a steep trajectory of seven degrees. Measuring several metres in size, the space rock exploded 25.6km above the Earth’s surface, with an impact energy of 173 kilotons 10 times the energy released by the Hiroshima atomic bomb. The blast was the second largest of its kind in 30 years, and the biggest since the fireball over Chelyabinsk in Russia six years ago. 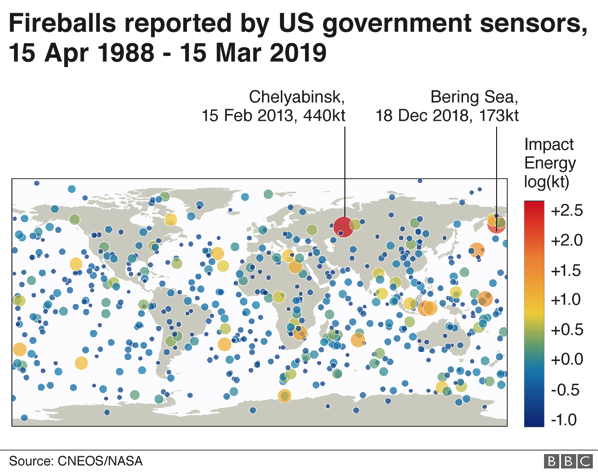 It was 40% the energy release of Chelyabinsk, but it was over the Bering Sea so it didn’t have the same type of effect or show up in the news. A fireball this big is only expected about two or three times every 100 years. A solar storm is incoming after a huge hole opened on the surface of the Sun’s atmosphere, scientists have warned. The storm, which could knock out GPS, mobile phone signal, and digital television, is expected to hit Earth on Friday, March 15, and is the result of a “canyon-shaped” hole in the Sun’s upper atmosphere. The long and narrow slit in the Sun’s atmosphere – known as a coronal hole – is unleashing a barrage of cosmic rays and unfortunately for Earth, it is in the way. Space weather forecasting experts have predicted the solar storm will reach us on March 15. 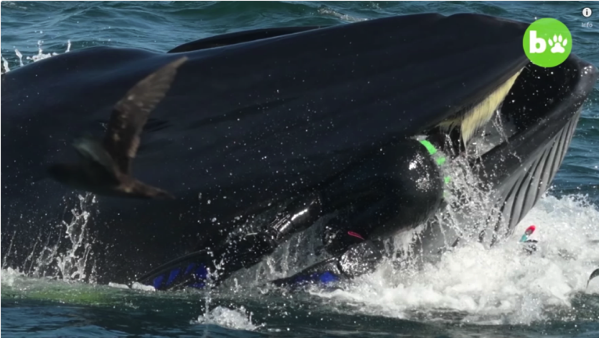 Off the coast of South Africa, a diver got pulled into the mouth of a whale along with a mass of sardines. Fortunately, the whale was likely as displeased about the situation as the snorkeler and spit the swimmer out within a couple of seconds. Every T. rex was once a vulnerable, feather-covered youngster.